Last week, I gave a short talk on DMR and Brandmeister at the South Eastern Amateur Radio Group club meeting. There were quite a few members present and there were plenty questions. The full presentation is available from here, but what is new (since the IRTS AGM presentation) is this image taken from Xastir. 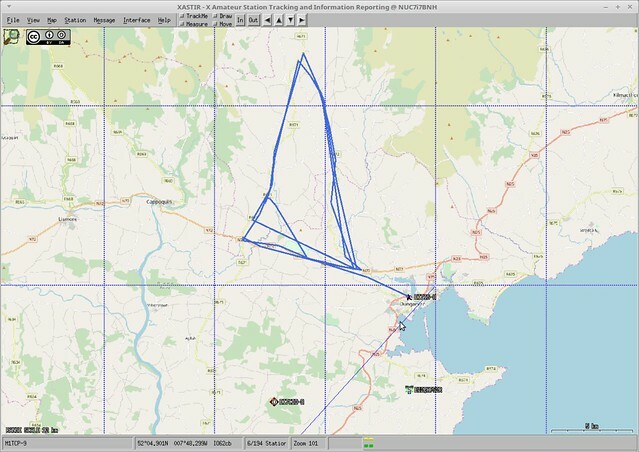 This is a track formed by a numberof GPS position information beacons from my Retevis RT8 Radio, the data bursts are received at the EI7CDD DMR Repeater, and then forwarded to the worldwide APRS Internet Service backbone before appearing on the map. What is interesting to me is that the RT8 was just thrown on the dash of a van, no special effort was made to optimise its position, the terrain is by no means flat, undulating would be the best description, and yet, the RT8 was still able to hit the EI7CDD repeater from up to 20k away. I got an email from my better half this morning asking me what deliveries I was expecting as the postman had left a note. I couldn’t think what it could be and quickly forgot about it. 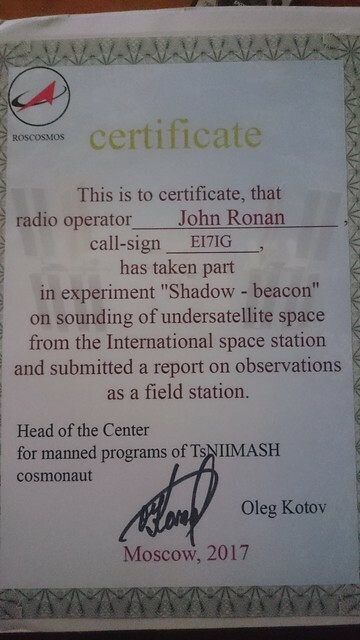 What a lovely certificate for my (fairly minimal) participation in the experiment. In fairness the photograph taken with my phone does not do it justice. In a conversation late last year (at the TAPR DCC) I was asked what is the actual level of APRS activity in Ireland. Thinking about the answer for a while, I realised that I really didn’t know, and that got me wondering how to go about visualising it. 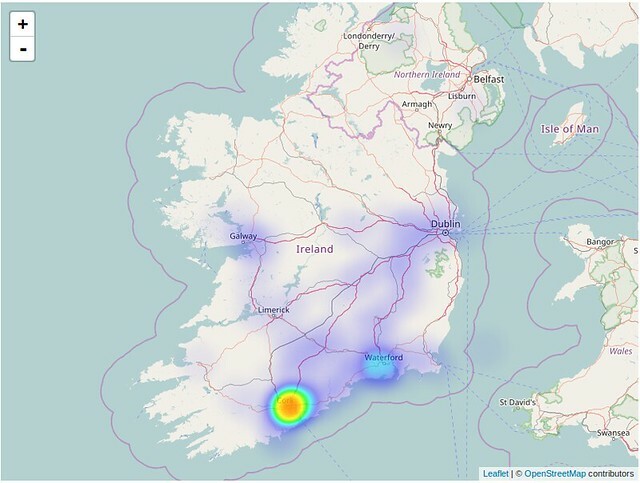 So, there you go, it is fairly conclusive that Cork city has the most ‘on-air’ APRS activity. This is followed by Waterford area, Galway area and then the main motorways. Kenwood TH-D72, Duracell vs Lithium. In keeping in the battery longevity theme here and here, recently, Don, AB1PH posted to the Yahoo TH-D72 group about some testing he did with primary cell batteries in the BT-15 AAA Holder. Don compared Everready Ultimate Lithium (L92) batteries, to Duracell Alkaline batteries. His TH-D72A was set-up to broadcast its location every 3 minutes. The Duracell’s lasted approx. 1h 40 minutes, with the Lithium batteries lasting approximately 7h. By any standard, approximately 4-5 hours is an appreciable difference, in fact that is almost equivalent to the run time of the original battery pack. Sure, they are more expensive, but, I know which I’ll keep spare. It’s a rainy day, nothing much else to be doing so why not throw some python together to link an ADS-B receiver to Xastir. Well, thats what G0HWW did this afternoon, while I cruised the HF bands for victims. More on TH-D72 battery life. I was chatting with two guys in the office about the results from my previous tests with the TH-D72. In the previous tests, the radio was configured to receive all APRS packets. Now, considering EI4HQ’s scenario, which was to have it with him while walking. He isn’t going to be very worried about the location of other APRS stations while out walking in the hills. Also,if another APRS station is within simplex range, Voice Alert will let him know. So, I just configured the Battery Saver on the TH-D72 to be more aggressive. Set for 1 second, this means that when the squelch is closed, and no key is pressed for more than 10 seconds, the radio switches the radio off for 1 second, then momentarily turns is back on in order to detect if any signal is present. As an aside, it is suggested in the manual that the battery saver be set to 0.03 seconds in order for APRS to work reliably. This is what it was set to in the previous tests. Anyway, at 1 second the first packet was logged at 08:44 in the morning and the last at 23:00 that evening. Giving approximately 14h 15 minutes of runtime. Setting the battery saver to 2 seconds, with the first packet at 08:35 and second at 00:02 increases that to approximately 15h 25 minutes. In other words, a 5 to 6.5 hour increase in battery life. That, i think you would agree, is a very useful increase in battery life. So EI4HQ and I were discussing “toys” and presents in general, and he inquired about the TH-D72 and battery life. I purchased mine in November 2010 (G0HWW twisted my arm) and have used it for various things from AREN events, listening to aircraft, DTN Experiments (PDF), silly IP over AX.25 tunnels, the usual. Anyway, I said to EI4HQ that I though it was about 8 hours, but I would check. The radio has a setting to allow it to transmit the position of the radio, automatically at fixed intervals (beacon interval). So, I did three experiments. I left the radio in the car for the day on all three occasions. Setting the beacon interval to 5 minutes the first day, 10 minutes the second, 20 minutes the third while the second side (transceiver) of the radio was monitoring the local voice repeater(EI7WDR). This was done just to see what the difference was in battery life, and I (and WE7U) was making the assumption that with the longer intervals, that the battery life would be better. Day 1, first beacon recorded on aprs.fi at 08:50, last at 18:06, total operational time of 9h 16 minutes. Day 2, first beacon recorded at 08:21, last at 17:41, total operational time of 9h 20 minutes. Day 3, first beacon recorded at 08:18, last at 17:18, total operational time of 9h. Now, today I had to drop down to WIT, so the onboard GPS had to come out of its power save mode for that short journey, which may account for the reduced battery life. Also there could have been more activity on the repeater, actually there was, I had a brief conversation for a few minutes with EI2HI in Cork on the way into work this morning. However, the results are pretty clear I think (and I would love to see someone else’s results to compare), that the once every few minutes position beacon is not the biggest load on the battery with everything else running. So what is the battery life? Without more experimentation, i would guess about 6 hours if I was out walking with it. That, I think, will have to be the next experiment. An amateur radio balloon carrying APRS on 144.390 MHz FM has left the USA. Requests have been sent out for APRS operators in the British Isles and Europe to listen for and help track the transatlantic balloon! The APRS transmission, call sign K6RPT-11, is on 144.390 MHz FM the standard APRS frequency in North America. Dec 13, 08:40 UTC: It changed course overnight, skipped Morocco, flew slightly North of Malaga and is now heading for Palermo, Italy at about 260kph. 09:25 UTC: It has slowed and dropped several thousand meters since the last beacon. I fear its heading for a dip in the Mediterranean. (AX.25) Packets from International Space Station. Nothing overly complicated. I am capturing the output from the mheard command, part of the Linux AX.25 tools package. The AX.25 port (Radio/TNC/Omnidirectional antenna) is listening for packets from the International Space Station and PCSAT. The output updates every 10 minutes and is available here. Pretty much what it says. Last Wednesday Xastir got OpenStreetMap support in CVS courtesy of Jerry Dunmire, KA6HLD. Even though Jerry says its early days yet, it is “good enough” for me already. Way to go Jerry!